This Terms of Service Agreement (referred to as the "Agreement") is a contract between you and Classical Archives, LLC (referred to as the "Archives," as "we," as "us" or as "our") that governs both parties' rights and obligations regarding the providing of and the use of the website and music services operated by the Archives including Updates (defined in Section V, below) as they may occur from time to time. The website (referred to separately as the "Site") and all the music services operated by the Archives are referred to as a "Service" or the "Services" in this contract. Another document is also part of this contract. This contract may be updated from time to time. You must be old enough. If you have attained the age at which one may enter into legally binding contracts where you live (generally, but not always, 18 years of age in the United States), you may agree to enter into this Agreement. If you have not yet reached that age and you are at least 13 years of age, you should review this Agreement with your parent(s) or guardian(s) to make sure both you and your parent(s) or guardian(s) understand and agree to the terms and conditions presented in this Agreement. Each of the Services covered by this Agreement is only available to individuals 13 years of age or older. In using the Service you may encounter music, images, video, text, or other material available through the Service, collectively defined as "Content," which may or may not be identified as containing explicit language, that may be objectionable, offensive, or indecent. You understand this and agree to use the Service at your own risk in this regard and that neither we nor any of our licensors shall have any liability to you for any Content found to be objectionable, offensive or indecent. Where you live will determine which recordings and related materials will be available to you. Significant portions of the recordings and other materials available through use of the Services may not be available in all countries. Licensing of recordings is often done on a country by country or region by region basis. We can only offer recordings and related materials where we are licensed to do so. We intend to expand our geographical coverage over time. You understand and acknowledge that some territorial limitations exist and that it means that the recordings and related materials available to you depend on where you live, and availability of recordings and related materials in other countries may be different from your country. You also understand and agree that the burden is on you to evaluate whether the recordings and related materials available to you are sufficient in kind and in quantity to induce you to subscribe to any of the Services. You agree not to attempt to access Content outside the areas where we and/or our licensors allow it to be displayed and used in the Service. This means that if you are traveling outside the area where you live and where the billing address for the card you used to register to the Service is located you may not be able to use the Service or you may only be able to access a portion of the Content you would otherwise be able to access. You agree that we and our licensors may use certain technologies to verify that you do not attempt to access Content that is subject to geographic restriction outside the area permitted by us and/or our licensors for access to that Content. Before the time that you register to use the Services, we will use your IP address to determine which recordings and other materials we are able to present to you and/or allow you to use and/or purchase. Once you register, we will use your credit card billing address for those purposes. Services currently offered include a Subscription Music Service which, for either a monthly or yearly fee, allows users the opportunity to listen to recordings (this is called "Streaming" a recording or listening to a "Stream") and samplings of recordings and to view materials related to the recordings in accordance with their status as either Free Users or Subscribers and in accordance with the Subscription Usage Rules, below, and a Download Music Service which allows users the opportunity to listen to samples of recordings, purchase recordings (each such purchased recording is referred to as a "Permanent Download"), and to view materials related to the recordings. The range of services we offer may change over time. Any service that is offered now, or in the future, under this Agreement will at the time we are offering it to the public be referred to in this Agreement, individually as a "Service" and collectively, as the "Services." Ancillary services such as our user forums are considered part of our Services and will be governed by the rules of this Agreement. The Services are provided solely for Free Users' or Subscribers' personal enjoyment and are not to be shared in any way not explicitly permitted. Each Service we offer may be subject to territorial restrictions as discussed under "Where you live will determine which recordings and related materials will be available to you," above. Those restrictions mean that not all Content we have licensed for use in the Services will be available in all countries. The recordings and the materials related to the recordings made available on the Services may change over time and are all to be determined either solely by us, by our agreements with our licensors, or by us and our licensors. It is your sole responsibility to avoid loss or destruction of, or any other damage to, any recordings or any other materials you download from the Services. We are under no obligation to replace or otherwise compensate you for any such loss, destruction or damage. Notwithstanding any other provision of this Agreement, we and our licensors reserve the right to change, suspend, remove or disable access to any Content, products or other materials comprising a part of the Service or the Site at any time without notice. In no event will we or our licensors be liable for any such change, suspension, removal or disabling. We and our licensors may also impose limits on the use of or access to certain features or portions of the Service or of the Site without notice and without liability. We and/or our licensors own all copyrights in and to the Content, the Service and the Site and we and our licensors reserve all our rights in both law and equity. You agree not to make any use of the Content that would infringe the copyright therein. Our logos and trademarks, service marks, graphics used in connection with the Service, including but not limited to the unicorn logo, ClassicalArchivesTM, and Music for the Rest of Us® are trademarks or registered trademarks of Classical Archives, LLC in the United States and/or other countries. Other trademarks, logos, service marks, and graphics used in connection with the Service may be the trademarks or registered trademarks of their owners. You acknowledge that you are not granted any right or license to use any such logos, trademarks, service marks and graphics in any way. We reserve the right to modify or discontinue, temporarily or permanently, any of the Services with or without notice to you at any time or from time to time. You agree that you understand this and that we will not be liable to you or to any third party for any modification or discontinuance whether temporary or permanent. To use the Service you must possess a compatible computer and operating system, Internet access (for which additional fees may apply), a compatible version of media playing software and other hardware (such as headphones or speakers, or a hard drive for storage). It may be necessary over time for you to upgrade, or obtain updates to, any of these items in order to continue to meet the system requirements for the Services. The performance capabilities of each of these items can dramatically affect the overall performance available to you as an individual user. High speed Internet access is strongly advised. The system requirements may change over time. Continuing to meet those requirements is your sole responsibility. Types of users of the Services. Users of the Services who are not charged any fees unless they choose to purchase Permanent Downloads (referred to as "Free Users") must register by providing a valid email address. The Free User's IP address will determine which Content will be presented for viewing and possible purchase by them. Each individual, natural person is limited to a single registration and/or subscription. Free Users may listen to up to 5 full length recording files per day with a maximum of 100 full length recording files per month. The full length recording files that Free Users may listen to will be limited to those selected for such use in our sole discretion. Free Users may also listen to recordings or segments of recordings we make available for them to use to sample or evaluate a recording to assist them in deciding whether or not to purchase a Permanent Download. Free Users are not allowed to listen to any recording files not selected by us for such types of listening. Free Users may also purchase recordings made available for download purchase by us and our licensors in the area in which the Free User resides and in which billing address for the Free User's credit card used for registration purposes is located. This Free User status is also referred to as a "Free User Account." Users of the Services who pay fees beyond charges for purchases of Permanent Downloads or who would pay such fees but for our decision not to charge them such fees for reasons within our sole discretion (both referred to as "Subscribers") must provide a valid email address and a valid credit card. The credit card billing address and/or the Subscriber's IP address will determine which Content will be presented for viewing and possible purchase by Subscribers. Subscribers may listen freely to full length recording files subject only to a reasonableness limit which will be determined and applied in our sole discretion. Fees paid by Subscribers vary depending on the length of the subscription period. Our current options for Subscribers are presented here. To use the Services, you must register and provide us with a valid email address and, if a subscriber or nonsubscriber purchaser of Permanent Downloads, also a valid credit card. A credit card may only be used for one registration. Some of our licensors require us to screen users by geographic location to determine which content we are allowed to market and sell to particular users. Users must also create a username and a password. You agree that you will provide all of this information accurately and that you will update it as necessary so that it remains accurate over time. You agree that you will not allow others to use your username, your password or your account and that you are solely responsible for keeping this information secure and confidential. You also agree that you will be solely responsible for any losses due to unauthorized use of your username, password and account and you agree to indemnify and hold us and our licensors, affiliates, employees, contractors, officers, and directors harmless for any unauthorized or illegal uses of your username, password and/or account. Free trial period and initial subscription. You may receive a free trial period within which you are able to use certain features of the Services at no charge to you so that you may determine whether or not you wish to subscribe to a Service. Free trial periods are available only one time per individual natural person who has not previously subscribed to a Service and only once per credit or debit card. Free trial periods are not available in conjunction with a gift of a subscription to a Service. If you have registered to receive a free trial of any Service, and you decide you do not wish to complete the free trial and become a Subscriber just terminate your free trial before the end of the last day of your free trial period and you will not have any obligation to us for the subscription that would otherwise result and your credit card will not be charged a subscription fee. Otherwise, immediately following the end of your free trial period, your Subscription will automatically start and the subscription fees related to the subscription you selected when registering and initiating your free trial period will be charged to the credit card number provided to us during the registration process. Your subscription will automatically renew at the end of each subscription term for another term of the same length as the expiring term unless you notify us before the end of your subscription term of your desire to not renew. The fees for the subscription renewal will be those in effect at the time of renewal for a subscription with the features of your expiring subscription, or if the exact set of features is no longer offered, the set of features which then most closely matches that of your expiring subscription, and the term of your expiring subscription. You may upgrade from being a Free User to being a Subscriber at any time. To do so access your My Account page and follow the directions posted there. You may upgrade from being a Monthly Subscriber to being a Yearly Subscriber at any time. If you upgrade from being a Monthly Subscriber to become a Yearly Subscriber the amount you have been charged for your monthly subscription will be prorated over the number of days in the month and the prorated amount allocated to the days remaining in the month will be credited against the amount due to your new Yearly Subscription. To accomplish this upgrade access your My Account Page and follow the directions posted there. You are not permitted to record Streams. Nor, are you permitted to redistribute Streams in any way. Cancellation of subscriptions and subscription refund policy. You may cancel your Subscription at any time. If you are still in your Free Trial period your cancellation will become effective immediately. Otherwise, as a Monthly Subscriber or Yearly Subscriber, your cancellation will become effective for the next billing cycle, monthly or yearly as appropriate, and you will not receive any refund of subscription fees charged for the subscription period in which you tell us you wish to cancel. In our sole discretion, we may terminate this Agreement and/or suspend your Free User Account, your Subscription (Free Trial, Monthly or Yearly) and/or your right to access or in any way use the Services at any time without notice to you in the event that you breach any provision of this Agreement, or in the event that we reasonably believe you have breached any provision of this Agreement. In the event of such a suspension or termination, we will have no obligation to you and we will not refund any amounts you have paid to us to you. Permanent download purchases and advertised bit rates. 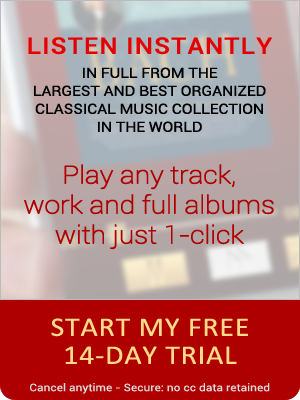 Permanent Downloads may be purchased by Free Users or Subscribers in nonrefundable sales as individual recordings, as grouped recordings, or as albums, or in certain cases, only as albums. Sales prices for individual recordings, grouped recordings and albums are as indicated on the website and are subject to change without notice. Actual bit rates of Permanent Downloads may vary by as much as 10%, higher or lower, than the bitrates shown on the Services. To simplify presentation bit rates shown on the Services are limited to a few different rates. Permanent Downloads, which are all DRM-free on our site, may only be copied as reasonably necessary for your personal, noncommercial use. 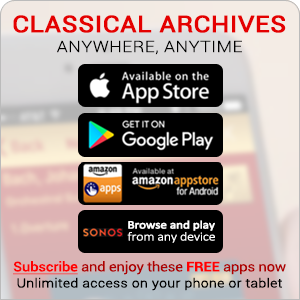 MP3's of SONY BMG products are sold directly by SBME Digital LLC via Classical Archives as its agent. You understand that the Service and software used in connection with the Service may include security components that permit digital information to be protected and use to occur only as permitted by usage rules set by us and/or our licensors. That means certain special considerations apply. By installing, copying, or otherwise using the Service or its software, you acknowledge that you have read and understood this Agreement, and agree to be bound by its terms and conditions. If you do not agree to (or cannot comply with) the terms and conditions of this Agreement, do not install, copy, or use the Service, software or any Content. You agree that you will not reverse engineer, decompile, disassemble, or otherwise tamper with any of the security components, special rules or other protection applications for any reason whatsoever. You agree to abide by the rules and policies we establish from time to time. Such rules and policies will be applied generally in a nondiscriminatory manner to users of the Service and software, and may include, for example, required or automated updates, modifications, and/or reinstallations of the software and obtaining available patches to address security, interoperability, and/or performance issues. The Service and any related software may enable you to listen to, view, and/or read (as the case may be) Content that may be obtained by you in digital form, and you shall do so solely for your personal, noncommercial entertainment use. This Content may be owned by us or by third parties. However, in all circumstances, you understand and acknowledge that your rights with respect to Content you obtain through the Service will be limited by copyright law and/or by the Usage Rules, as described here. "Usage Rules" are the licensing rules assigned by us and/or the pertinent licensor that limit your access to and use of Content. The Usage Rules will govern your rights with respect to Content regardless of whether unauthorized rules have been associated with that Content by another party. You further agree that you will not attempt to modify the software, the Content, or any of the Usage Rules for any reason whatsoever, including for the purpose of disguising or changing ownership or source of the Content. The software enables us to control your access to Content in accordance with the Usage Rules. We, for ourselves and for our licensors, reserve the right to enforce the Usage Rules with or without notice to you. You represent, warrant and agree that you are using the Service hereunder for your own personal, noncommercial entertainment use and not for redistribution of any kind. You agree not to redistribute, broadcast, publicly perform or publicly display Content, or otherwise transfer any copies of Content obtained through the Service. Monthly subscribers are billed monthly, in advance, for each month's subscription to a Service commencing upon their registration for the Service or at the end of their free trial period. Yearly subscribers are billed yearly, in advance, for each year's subscription to a Service commencing upon their registration for the Service or at the end of their free trial period. Up to one week before the end of each billing period, we will charge your credit card or other billing method on file for your subscription renewal at the rate then in effect for the Subscription type you used for billing period that will be ending, unless you tell us to cancel your subscription at least one week before the end of the subscription term. As provided in Section XIX, above, you may cancel your subscription at any time. If you cancel after you have been billed for an ensuing month or year, as appropriate, but within the period of time allowed that will mean you are entitled to a refund of the related subscription costs, those subscription costs will be refunded to you via the original means of payment. We start the billing process when we do to try to minimize service disruptions due to problems successfully charging your credit card or other payment mechanism. In this way we are able to contact you before a disruption in service to notify you of the problem and allow some time for you to remedy the problem. Once you click on the final Accept or Proceed button in the checkout section, you specifically give us the authorization to submit the bill to your credit card or other account as indicated in your billing method on file (without further login or authorization). Purchases or subscription fees billed after a first charge are done by reference (through encrypted communications) as we do not keep any billing details (such as credit card numbers) on our own servers. These details are only available to our sole billing partner, Paypal. Obligation to pay and credit card authorization. Agreement and obligation to pay. You agree that it is your obligation to pay and you agree to pay all charges and any other costs or fees (including but not limited to sales or VAT or similar taxes) incurred in connection with your use of the Services and/or the use of your credit card or other payment method and username in connection with use of the Services. You agree that we may accumulate separate charges and aggregate them prior to submitting the charges to your credit card issuer or other payment method provider. You further agree that if payment is not received by us from your credit card issuer or other payment method provider you will pay all amounts due upon our demand. Free trial credit card pre-authorization. You agree that we may obtain authorization in advance from the issuer of your credit or debit card to charge subscription fees to the card in the event you do not cancel your free trial at least 24 hours before it would otherwise end. Although the pre-authorization is a guarantee from your card issuer and not an actual charge to the card, card issuers have their own policies regarding the treatment of pre-authorizations. Some card issuers may treat the pre-authorization as a pending charge and reduce your available credit by the amount pre-authorized. You agree that we are not responsible for any consequences that may occur as a result of your card issuer's responses to our obtaining a pre-authorization. These responses may include, but are not limited to, a temporary unavailability of part of your otherwise available credit line and the imposition of overlimit fees. Taxes and other amounts related to use of Services. Any taxes or other amounts (such as late fees) incurred in connection with your Subscription or in any other way connected to your use of the Services are your sole responsibility and will be charged to your credit card or your PayPal account or other means accepted as payment as appropriate. We will charge tax in those states and/or countries where digital downloads or services are taxable. We are not able to consider applications for exemption from VAT’s or sales taxes or their equivalents. All transactions subject to such taxes will include charges by us for them. You agree to indemnify and hold us, our affiliates, members, employees, contractors, licensors, officers, directors, distributors and subsidiaries harmless from any claim or demand, loss, cause of action or judgment (including court cost and attorneys fees) due to or arising out of or related to your breach of this Agreement or your use of any of the Services. Governing law and personal jurisdiction. This Agreement and your use of any Service are to be governed by the laws of the State of California without regard to, or application of any conflict of laws or choice of law provisions. You expressly agree to the exclusive jurisdiction and venue of the federal and state courts in the State of California regarding any claim or dispute with us relating in any way to your use of any Service regardless of whether other local, state, national or international laws may also apply. You also expressly agree and consent to personal jurisdiction over you by the federal and state courts in California for all claims or disputes involving us, or our licensors, affiliates, employees, contractors, officers, directors or suppliers. The section titles in this Agreement do not in any way constrain or change the other terms and conditions of this Agreement. They are present merely to help make reading this Agreement easier. In the event that any part of this Agreement (the "replaced part") is held to be invalid or unenforceable for any reason, the rest of this Agreement shall continue without change in full force and effect and the part of this Agreement held to invalid or unenforceable will be deemed to have been replaced with language that most nearly reflects the intent of the replaced part and most closely provides the same coverage and effect as the replaced part. WE MAKE NO WARRANTY THAT THE SERVICE WILL MEET YOUR REQUIREMENTS OR THAT YOUR USE OF THE SERVICE WILL BE UNINTERRUPTED OR FREE OF ERRORS. WE MAY HAVE TO "TAKE THE SERVICE DOWN" FOR MAINTENANCE OR OTHER REASONS FROM TIME TO TIME. WE MAY HAVE TO REMOVE CERTAIN CONTENT FROM TIME TO TIME AND WE MAY CANCEL THE SERVICE AT ANY TIME WITHOUT NOTICE. ALL MATERIAL DOWNLOADED OR OBTAINED IN ANY WAY TROUGH USE OF THE SERVICES IS ACCESSED AT YOUR OWN RISK. YOU WILL BE SOLELY RESPONSIBLE FOR ANY DAMAGE TO YOUR COMPUTER OR ANY OTHER DAMAGE OR LOSS, INCLUDING LOSS OF DATA, THAT RESULTS FROM THE DOWNLOAD AND/OR ACCESS OF ANY SUCH MATERIAL. YOU UNDERSTAND AND AGREE THAT YOUR USE OF THE SERVICE IS AT YOUR SOLE RISK. THE SERVICE INCLUDING ALL CONTENT AND OTHER INFORMATION, MATERIALS AND PRODUCTS INCLUDED ON OR OTHERWISE MADE AVAILABLE TO YOU THROUGH THE SERVICE ARE PROVIDED "AS IS" AND ONLY "AS AVAILABLE" WITHOUT WARRANTIES OF ANY KIND FROM CLASSICAL ARCHIVES, ANY OWNERS OF CONTENT OR ANY LICENSORS OF CONTENT. TO THE FULL EXTENT PERMISSIBLE BY APPLICABLE LAW, CLASSICAL ARCHIVES, ALL OWNERS OF CONTENT AND ALL LICENSORS OF CONTENT DISCLAIM ALL WARRANTIES, EXPRESS OR IMPLIED, INCLUDING BUT NOT LIMITED TO, IMPLIED WARRANTIES OF MERCHANTABILITY AND FITNESS FOR A PARTICULAR PURPOSE AND ANY WARRANTY OF TITLE OR NONINFRINGEMENT. THIS EXCLUSION OF IMPLIED WARRANTIES MAY NOT APPLY TO YOU BASED ON THE LAWS WHERE YOU LIVE. NEITHER CLASSICAL ARCHIVES NOR ANY OWNER OF CONTENT OR LICENSOR OF CONTENT WARRANTS THAT THE SERVICE OR ANY CONTENT, INFORMATION, MATERIALS OR PRODUCTS INCLUDED ON OR OTHERWISE MADE AVAILABLE TO YOU THROUGH THE SERVICE ARE FREE OF VIRUSES OR OTHER HARMFUL COMPONENTS. THE RISK OF ANY LOSS, DAMAGE OR ANY OTHER HARM BASED ON OR ARISING OUT OF USE OF THE SERVICE RESIDES SOLELY WITH YOU. IN NO EVENT SHALL WE OR ANY OF OUR LICENSORS, AFFILIATES, EMPLOYEES, CONTRACTORS, OFFICERS, DIRECTORS OR SUPPLIERS BE LIABLE FOR ANY DAMAGES, WHETHER DIRECT, INDIRECT, INCIDENTAL, CONSEQUENTIAL, SPECIAL, PUNITIVE, OR FOR LOST PROFITS, OR ANY OTHER CLAIM ARISING OUT OF, OR IN ANY WAY RELATED TO, YOUR USE OF THE SERVICE OR YOUR INABILITY TO USE THE SERVICE. BECAUSE SOME STATES, PROVINCES, JURISDICTIONS OR COUNTRIES DO NOT ALLOW THE EXCLUSION OR LIMITATION OF LIABILITY FOR CONSEQUENTIAL, INCIDENTAL OR OTHER DAMAGES, SOME OF THE LIMITATIONS ABOVE MAY NOT APPLY TO YOU, OUR LIABILITY, WILL HOWEVER, BE LIMITED TO THE MAXIMUM EXTENT SUCH LIMITATION IS PERMITTED BY LAW.